Sodium Aluminum Sulfate offered by us, is used as acidic media for liberation of Carbon Dioxide from Sodium Bi Carbonate. It is easy to store and does not leave any unpalatable taste. 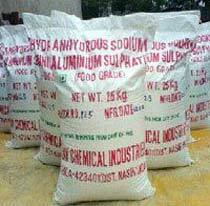 Sodium Aluminum Sulfate is most effective and economical acidic media. We are counted as one of the leading Manufacturers and Exporters of Sodium Aluminum Sulfate.